Governor Andrew M. Cuomo announced today that the capping of the Onondaga Lake bottom is now complete. 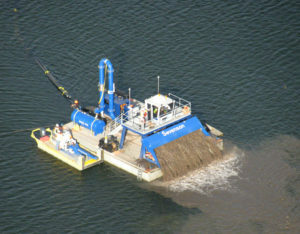 During the revitalization of Onondaga Lake, Sevenson Environmental Services, Inc. out of Niagara Falls, NY was tasked with removing a total of 2.2 million cubic yards of sediment that was hydraulically dredged from the bottom of the lake and adjacent shoreline areas from 2012 to 2014, and approximately 3.1 million cubic yards of cap material was placed in Onondaga Lake from 2012 to 2016. Honeywell’s completion of the dredging and capping is a significant benchmark in the revitalization of Onondaga Lake. The cap consists of layers of sand, gravel, and topsoil, which range from four to 66 inches in thickness. The cap is designed to isolate remaining contaminants from the water column. The cap was put down in layers and becomes more stable with time. In addition, naturally occurring sedimentation is expected to further increase the cap thickness and is occurring faster than anticipated. DEC will conduct ongoing monitoring of the cap and all aspects of the cleanup remedy. The cleanup of Onondaga Lake is creating opportunities for the public to reconnect with the lake. DEC is working to design and construct a public boat launch along the shoreline off Interstate 690 Exit 7 near the New York State Fairgrounds and Lakeview Amphitheater. The boat launch will provide access to motorboats, canoes and kayaks. Initial plans for the boat launch include a double launch for trailer boat launching, a car top boat/kayak launch, up to 30 parking spaces for cars with trailers, an additional 30 parking spaces for individual cars, as well as an accessible fishing platform or pier for deep water shoreline fishing. Earlier this week, the New York State Department of Environmental Conservation and U.S. Fish and Wildlife Service released a draft Natural Resources Damage Assessment and Restoration Plan and Environmental Assessment for public comment through June 2, 2017. Governor Cuomo is directing DEC to host three public information sessions in addition to the open house scheduled for April 27, to ensure the public has ample opportunity to provide feedback on this important proposal. To date, the public has made valuable contributions to the plan solicited through a variety of means. The draft plan can be found here. Dredged sediments are permanently stored—fully encapsulated by a liner and soil cover—on the 55-acre sediment consolidation area on the Honeywell property in the town Camillus. Planting of an initial vegetative cover on the consolidation area is nearly complete, and native grasses and vegetation will be added in 2017.